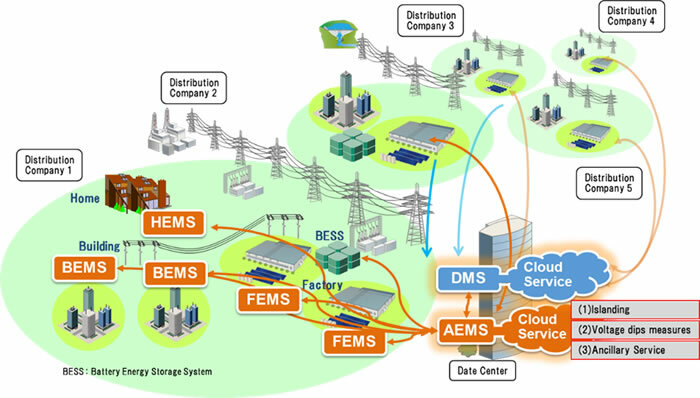 New Energy and Industrial Technology Development Organization (NEDO) and Hitachi, Ltd. will expand the Smart Community Demonstration Project being carried out jointly with ELES, d.o.o., Slovenia's state-owned electricity transmission system operator, and will start demonstration of a cloud-based Advanced Energy Management System (AEMS) for the first time from October 2018. In advance of this, NEDO, Slovenia's Ministry of Economic Development and Technology, Ministry of Infrastructure, and ELES d.o.o. agreed to joint implementation of the expanded project scope and signed the revised version of Memorandum of Cooperation (MOC), Minutes of Meeting (MOM) and Memorandum of Understanding (MOU), respectively, on September 24. At the same occasion, Hitachi, Ltd., which is NEDO's entrusted party, and ELES, d.o.o. signed the revised version of Implementation Document (ID). DMS(Distribution Management System): A management system for distribution systems. Under demonstration as part of this project since November 2016. In view of this situation, Slovenia is likely to need more sophisticated and cost-effective distribution grid management technologies to solve issues anticipated in connection with the increase in renewable energy sources and electricity demand, such as voltage fluctuation, power outage, overload and ensuring reserve and balancing power Meanwhile, consumers and electricity retailers need more sophisticated and cost-effective energy management technologies. Especially the power outage occurred due to the severe ice storm in 2014, and other outages affected by extreme weather in recent years raised the importance of measures to protect critical facilities such as hospitals against huge power outages. Damage from voltage dips (a momentary decrease in voltage caused by snowfall, lightning strike or other natural disaster) also have a serious impact on large consumers that need high quality electricity such as factories, and voltage dips mitigation measures are, therefore, required. Moreover, in the future, number of consumers that have BESS are expected to increase and consumers will also be expected by electricity transmission system operators to contribute to grid stability. Under these circumstances, on November 25, 2016, New Energy and Industrial Technology Development Organization (NEDO), Solvenia's Ministry of Development and Technology and Ministry of Infrastructure as well ELES. d.o.o., Slovenia's state-owned electricity transmission operator agreed to carry out a smart community demonstration project. Hitachi Ltd., NEDO's entrusted party, and ELES, d.o.o have been selected to undertake a joint project under such agreement. Hitachi and ELES have been implementing the distribution management system (DMS) for electricity distribution companies, which is scheduled to run until December 2019. NEDO, Slovenia's Ministry of Economic Development and Technology, Ministry of Infrastructure, and ELES, d.o.o., have now agreed to expand the scope of the demonstration project for large consumers and electricity retailers and to start a demonstration project for a cloud-based Advanced Energy Management System (AEMS), and the parties signed the revised version of Memorandum of Cooperation (MOC), Minutes of Meeting (MOM) and Memorandum of Understanding (MOU) respectively on September 24. At the same occasion, Hitachi, Ltd. and ELES d.o.o. agreed to jointly implement this new demonstration scope and signed a revised version of the Implementation Document (ID). (1) Islanding The system is linked with the DMS and prevents huge power outages by isolating areas that contain critical facilities such as hospitals from the grid and providing electricity from BESS during power outages. (2) Voltage dips mitigation measures The system mitigates voltage dips caused by snowfall, lightening strike or other natural disaster at factories and other consumers that require a high-quality electricity supply by using BESS installed within the area to protect consumers' critical facilities from voltage dips. (3) Ancillary services The system link with BESS and xEMS installed at consumers within the area and provides frequency control to electricity transmission system operators that contributes to grid stability. 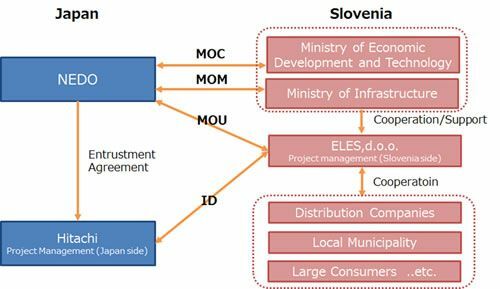 NEDO signed MOC with the Ministry of Economic Development and Technology in Slovenia NEDO signed MOM with the Ministry of Infrastructure in Slovenia NEDO signed MOU with ELES, d.o.o., Slovenia's state-owned electric transmission operator ELES, d.o.o. signed ID with Hitachi, Ltd.
At the signing ceremony held in Ljubljana, Slovenia on September 24 (local time), Mr. Hiroaki Ishizuka, NEDO Chairman, Mr. AleÅ¡ Cantarutti, State Secretary of the Ministry of Economic Development Technology, Mr. Bojan Kumer, State Secretary of the Ministry of Infrastructure, and Mr. Aleksander Mervar, the CEO of ELES signed the revised version of Memorandum of Cooperation (MOC), Minutes of Meeting (MOM) and Memorandum of Understanding (MOU) respectively and Mr. Masaaki Nomoto, Senior Officer of Hitachi, and Mr. Aleksander Mervar, the CEO of ELES signed the revised version of Implementation Document (ID) in the presence of His Excellency Mr. Keiji Fukuda, Ambassador Extraordinary and Plenipotentiary of Japan to Slovenia, His Excellency Mr. Zdravko PoÄivalÅ¡ek, Minister of Economic Development and Technology, and Her Excellency Ms. Alenka Bratusek, Deputy Prime Minister and Minister of Infrastructure (former Prime Minister), to establish a framework for cooperation in connection with implementation of the demonstration project.